With their enormous, deadly-sharp canines, saber-toothed carnivores are well known to many people as frightening and ferocious predators of the Cenozoic. Surprisingly, there is more than one "saber-toothed cat." The sabertooth morphology has appeared several times during the history of the mammals. Saber-toothed members of the Carnivora, (the mammalian order that contains cats, dogs, bears, weasels, and others) appeared independently at least twice. Saber teeth evolved both among the true cats, or the family Felidae (these saber-toothed cats are sometimes classified in a separate subfamily of cats, the Machairodontinae) and within the Nimravidae (an extinct carnivore family that was related both to the true cats and to the civets and mongooses). The Hyaenodontidae, a family of the extinct mammalian order Creodonta, also included saber-toothed members. Even saber-toothed marsupial "cats" or thylacosmilids inhabited South America from the upper Miocene to the late Pliocene. The saber-tooth morphology is an excellent example of convergent evolution as it appeared in several evolutionary lineages independently. Why the enormous teeth? Certainly they were used in hunting, but opinions vary as to exactly how they were used. Some paleontologists have suggested that they were used to grab and hold onto prey. However, attacking a large herbivore this way could easily break the saber teeth and saber teeth that were demonstrably broken during an animal's lifetime are rare in fossil deposits. A more plausible hypothesis suggests that saber teeth were used to deliver a fatal ripping wound to the belly or throat of a prey animal. Sabertooth carnivores may not have tried to grapple with prey. More likely, they delivered one crippling stab wound and then waited for the prey to die. We present two sabertooths, both classified in the order Carnivora, from different geological periods. Click on either picture to view an enlarged version. The "saber-toothed tiger," Smilodon, is the California State Fossil and the second most common fossil mammal found in the La Brea tar pits. The name "saber-toothed tiger" is misleading as these animals are not closely related to tigers. Juvenile to adult-sized fossils are represented in the large Berkeley collections. The first Chairman of the University of California Department of Paleontology, Professor John C. Merriam, and his student Chester Stock, monographed the morphology of this great carnivore in 1932. Since then, hundreds of thousands of Smilodon bones have been found at La Brea. These finds have permitted remarkably detailed reconstructions of how Smilodon lived. We now know Smilodon was about a foot shorter than living lions but was nearly twice as heavy. Also, unlike cheetahs and lions (which have long tails that help provide balance when the animals run) Smilodon had a bobtail. These suggest that Smilodon did not chase down prey animals over long distances as lions, leopards, and cheetahs do. Instead, it probably charged from ambush, waiting for its prey to come close before attacking. 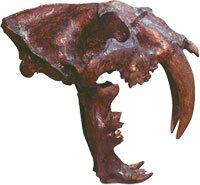 Smilodon is a relatively recent sabertooth, from the Late Pleistocene. It went extinct about 10,000 years ago. Fossils have been found all over North America and Europe. 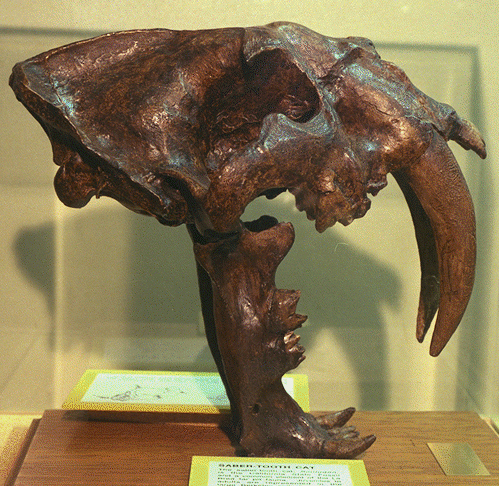 Smilodon fossils from the La Brea tar pits include bones that show evidence of serious crushing or fracture injuries, or crippling arthritis and other degenerative diseases. Such problems would have been debilitating for the wounded animals. Yet many of these bones show extensive healing and regrowth indicating that even crippled animals survived for some time after their injuries. How did they survive? It seems most likely that they were cared for, or at least allowed to feed, by other saber-toothed cats. Solitary hunters with crippling injuries would not be expected to live long enough for the bones to heal. Smilodon appears to have lived in packs and had a social structure like modern lions. They were unlike tigers and all other living cats, which are solitary hunters. Occasional finds of sabertooth-sized holes in Smilodon bones suggest the social life of Smilodon was not always peaceful. The cats may have fought over food or mates as lions do today. Such fights were probably accompanied by loud roaring. From the structure of the hyoid bones in the throat of Smilodon, we know it could roar. Hoplophoneus is another type of saber-toothed cat classified in the Felidae or true cat family. This creature lived in the Oligocene (e.g., about 20 million years older than Smilodon). This picture shows various bones of the skeleton of Hoplophoneus. Note the skull with its saber teeth in the center of the picture. The canines have a sharp bend and fit into a groove on an expanded process on the lower jaw: a feature seen in other sabertooths but not in Smilodon. Note also that Hoplophoneus was a relatively small cat. The skull is only about 15 cm long. Hoplophoneus was roughly the size of a bobcat, or about one and a half to two times the size of a housecat. Another exhibit, on Pleistocene saber-toothed cats of North America, is available from the Illinois State Museum. Also of interest is the web exhibit, "Cats! From Wild to Mild", presented by the Natural History Museum of Los Angeles County. Carroll, R.L. 1988. Vertebrate Paleontology and Evolution. W.H. Freeman & Co., New York. Mestel, R. 1993. Saber-toothed tales. Discover, April, pp. 50-59. Radinsky, L., and S. Emerson. 1982. The late, great sabertooths. Natural History 91(4).